Hi everybody! I totally have been neglecting my blogging…or at least…on this forum. I started a new blog about my trip to Roma (I’m studying abroad). Please feel free to follow my traveling blog! I’ve now been through Ireland and Paris…and there is plenty more to come! I would love your feedback and suggestions on places to go and things to see! If there is a day that I don’t walk into our room and see you crying…that will be the day. You have so much pain to hide. How do you do it? Sometimes I wish my words were more for you than an outsider’s gaze. I wish I could say, ” I understand,” and mean it. You have been my learning experience and my support system. Not only have you been there all this time to guide me through…at the same time as guiding yourself…but you have managed to teach me everything about life without even drawing up one lesson plan. I’ve never met a family more broken. Every day…I walk in…and you…as the responsible one…are taking care of your mother…or your brother…or your step dad…or your sister. You’re here…hours away…taking care of children who pose as adults. They cry out against one another…and you always mediate. It’s almost like your mother’s lack of maturity…every ounce of it…was held back from her…and God decided to give it all to you from the day you graced the world with your presence. It almost tried to keep you there with them…to be what they “need”. You got out though. You had the strength to give them what they actually needed…and to give yourself a chance. You are here. And you will change the world. The girl from the small city…the city that locks everyone in…you left. And here you are…in our nation’s capital. And you are winning. You are gold…you are a God loving, country critiquing, beautifully strong-willed soul. I have more than faith in you and your future. This is what the world needs more of…humans who come out of their heartbreak…and make life into meaning…and build themselves into the beautiful someone they are supposed to be. You have beat the odds. You are amazing. And the world, in all its agony, needs your strength more than any medicinal cure. One day…you will be its revival. 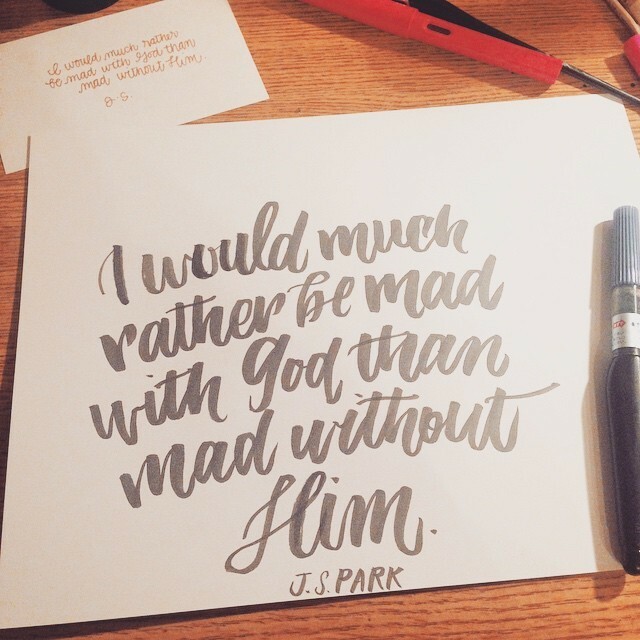 This is wonderful artwork from Cristina G., a quote from my newest book, Mad About God. It perhaps encapsulates the entire theme of the book. Thank you for the art, dear sister! …and even writing those words is a realization to me. It’s hard to accept the fact that anxiety actually exists. I’ve always been one of the doubters…oh anxiety? That can be fixed with some breathing strategy and repetitions of happy thoughts. I was wrong. Anxiety is real…and I have been dealing with it for some time. I started to feel dizzy at about 10:00 last night when we were watching Les Mis. I remembered at 9 PM mass that a family friend passed away a few years ago, and reality smacked me in the face: humans are fragile. I tried to forget the weakness I started to feel in my own organs…and to forget all the deaths surrounding me. But…my stomach pressed on…almost as if I was about to perform…my stomach dropped lower and lower to the ground…and I could not breathe out of it this time. I couldn’t jam my toes into the ground to stabilize myself; nothing was working. The anxiety came at me with it’s own tidal force. My roommate tried to calm me down…so I could sleep enough to wake up early and get my paper done…but nothing worked. I felt the ice enveloping my joints and lungs. I felt the blackness circling my eyes. I was either going to pass out or have a heart attack. It was that simple. I began to freak out about all I hadn’t done in my life. “I have to call my parents…I have to call my boyfriend…I have to see Italy! I’m so young.” And here came the height of my anxiety. This lasted for a few hours…until I called my dad and he calmed me down. Families are medicinal. So…I can attest…anxiety is real. That statement may be more for me than for anyone else, but at least now I appreciate it’s sway. Today is better. Hopefully, there will be sun. Where do I go? What should I do? What am I doing wrong? How can I find my purpose and what exactly is the point of being on this earth?